Stones, pebbles, rock. Universal objects and materials. Multitudes of uses, meanings and metaphor. A pebble beach, Bexhill coastline is filled with all shapes, sizes and colours of stones, with varied patterns, striations and markings. Collecting pebbles, skimming stones, picking them up and putting them down again, universal activities for so many beach visitors. The satisfying crunching sound they make under foot, albeit unstable, is one of the noises synonymous with time at the seafront. That and the inevitable caw of the seagulls cutting through the wild, calm and ever moving sea. I have tried to take sound footage of the seafront, trying to capture the atmosphere. Sounds are so evocative. The beating of the masts on the sailing boats. The sound of the sea whether crashing waves with frothy white tops of spray or barely there shoreline kisses and caresses, it is a constant. A reminder that the sea is a truly powerful beast, it holds me with such a strong connection. It is soothing, energising, frightening, exciting. It puts things in perspective. It is also at risk, our oceans are under enormous pressure. Something I will come back to, but for now my focus is the pebble. The humble, brown, blue, round, pebble. My intention for my journey was to make connections, make links. It was to see what unifies us and the things we share around the globe, irrespective of culture, creed, race or language. 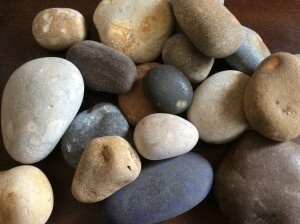 I have a small collection of stones and pebbles from times in my life and places I have been. I don’t remember the story of them all, and for that I am sad, but they are all important to me. So to collect pebbles along my route was an obvious intention. Travelling ‘light’ the idea of collecting stones in this way was was not very practical. I have picked up my back pack more than once to exclaim ‘what’s in this, rocks?’ only for it to gradually dawn on me that yes, there are certainly a number of stones in it. I have been careful of what I have collected, conscious of what a minefield collecting anything from the beach is in many places. So I hope, I have certainly tried, to be as conscious and aware of this all the time. What I have actually brought back is very little, but each object has been carefully labelled and stored, waiting to be sorted and accompanying stories told. A trail of breadcrumbs as I have since referred to it, is a trail of pebbles I have found and collected on the way between places called Bexhill and beyond. Crocheting a cover for each one was sufficient ‘intervention’ after which I would replace the now covered pebble where I found it, or would leave it at the next place I arrived. Or an alternative suitable spot. It became a challenge to find the ‘right’ place to leave each one. This became as important as selecting the pebble and making the crochet for it. A very ‘female’ act it felt a surprisingly rebellious thing to do. Crochet is an activity for firesides surely, I have an incredible woman in my family who I have fond memories of in association with crochet. The influence of women on this trip cannot go without comment. Annie (Brassey) is obviously a huge influence, who may or may not have crocheted (it was then considered a ‘poorer’ version of lace making from cursory research). Kate Marsden, another incredible woman from Bexhill. I tried to find trace of Kate through Siberia in her quest for a cure for leprosy but without success. She remains present in her connection with the museum and her adventures. And thus it seemed fitting to use an unapologetic ‘female’ ‘craft’ in my interventions around the world. Two words that can often draw negative connotations in themselves. 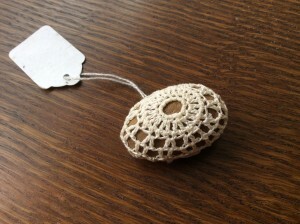 So, I launched on my quest from Bexhill (itself a place where crochet is not out of place). A town often known for it’s older population and being slightly old fashioned in many respects, this is one of the reasons I have such affection for the place. Armed with crochet hook and yarn and a book of patterns to follow I headed off to crochet my way around the world. 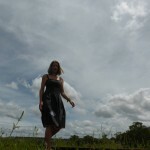 The first week or so was a bit of a whirl of train timetables and deadlines, with little time for dawdling or pondering. Until I reached the Trans Mongolian Train. Here I had five days to do little else but ponder and dawdle, interrupted only by the routine of making tea and noodles, watching for wisps of smoke from the houses in the distance, and an occasional game of ‘Dobble’. Train travel is perfect for pondering, wandering and crochet. To start with it felt a little clumsy, finding a way of introducing my new found friends and companions to my crochet exploits. I was a little sheepish, it took a while to get used to. It draws attention. Crochet is indeed an act of rebellion, perhaps. My later meeting with the Knitting Nanas was wonderful, a truly incredible bunch of ladies doing wonderful work while also making fabulous woollen items. This entry was posted in a trail of breadcrumbs, Bexhill, train travel and tagged Annie Brassey, Bexhill, Bexhill Museum, connections, crochet, Kate Marsden, Knitting Nanas, Omsk, pebbles, Russia, sea, Siberia, stones, train, Trans Mongolian Railway, women on September 27, 2014 by Louise Kenward.